William Mansfield born 1816 in Crediton, Devon. William Mansfield was born in Crediton, Devon, England in 1816 and was baptised on the 24th June in the same year. He was the second child of William Mansfield of Culmstock and Susanna Pearce Andrews of Topsham. Both towns are only a few miles from Crediton. He married Elizabeth Green (born 1806) in Oakhampton, Devon in 1840. In the 1851 Census he was aged 34 and living in Mill Lane, North Tawton, Devonshire. There was a large woolen mill in North Tawton employing around 150 workers and was probably the reason William moved there. His Father William was living with them, away from his wife Susanna, probably just to get work.and although 67 years of age he still seemed to be employed at the mill. 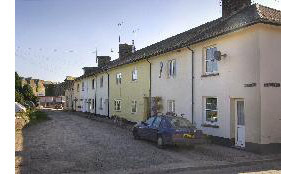 Pictured opposite is Mill Lane, North Tawton. The only reference to the family in the 1881 census is of Elizabeth who is head of the household and living alone in Tregavarah, Madron, Cornwall. She is 74 years of age and her birthplace is given as Sancreed (St. Creed), Cornwall which is only about 4 miles South West of Madron and close to Lands End. Sometime between 1851 and 1861 the family removed to Cornwall and Williams death is registered in Penzance, July - September 1872, aged 56. Tregavarah is a small hamlet 2 miles North West of Penzance and in 1881 consisted of only eleven homesteads with the Reynolds and Matthews being the largest families.Elizabeths death is recorded in the Penzance register of deaths, April-June 1894, aged 88. She was buried at Madron on the 27th May 1894.